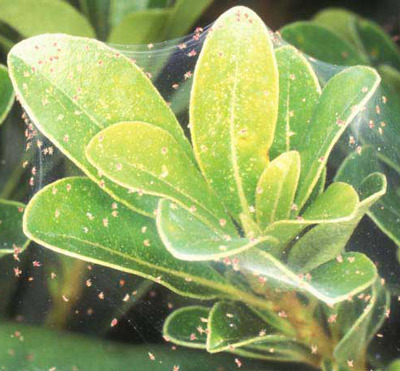 The southern red mite, Oligonychus ilicis (McGregor), is an important spider mite pest of broad-leaved evergreens. Bolland et al. (1998) reported the southern red mite from from seven countries on four continents, feeding on 34 plant species in 15 families. The southern red mite is called the coffee red mite in Brazil. Figure 1. Adult southern red mites, Oligonychus ilicis (McGregor). Photograph by R.F. Mizell, University of Florida. McGregor first described Oligonychus ilicis as Tetranychus ilicis in 1917, from American holly (Ilex opaca) in South Carolina. McGregor transferred the species to the genus Paratetranychus in 1919, and Pritchard and Baker (1955) placed it in the genus Oligonychus. The holotype is in the Smithsonian’s United States National Museum. The general distribution of the southern red mite includes the Northern Hemisphere and South America. 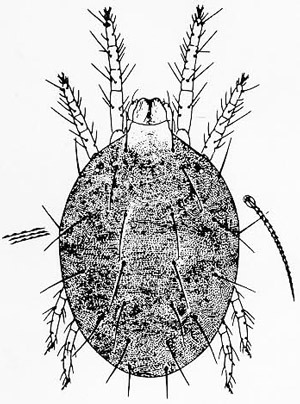 Although the southern red mite was described in the United States, Pritchard and Baker (1955) suggested it might have originated in the Far East. Published distribution records includes: Brazil, Italy, Japan, Korea, the Netherlands, Paraguay, and the United States. Although Oligonychus ilicis was reported from Australia (Knihinicki et al. 1999), the Australian Department of Agriculture, Fisheries and Wildlife reports it as eradicated (Anonymous 2006). In the United States, the southern red mite has been found in Alabama, California, Florida, Louisiana, Massachusetts, New Jersey, New York, North Carolina, Ohio, South Carolina, and Virginia. It is probably widespread on broad-leaved evergreens in the eastern United States. The adult female is approximately 385 µ (1/50 inch) in length with a rotund-elliptical body. The adult male is approximately 300 µ in length, much less rotund, and narrowed posteriorly. The male aedeagus is shown below in Figure 4. 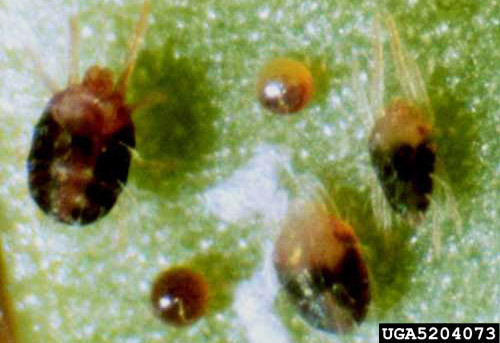 Both sexes are reddish brown, and darker than most red spider mites found on woody ornamentals. This species is more translucent towards the front end of the body (Mizell et al. 2002). Figure 2. Eggs (center), nymphs (right), and adult (left) of Oligonychus ilicis (McGregor). Photograph by Jim Baker, North Carolina State University; www.forestryimages.org. Figure 3. Adult female southern red mite, Oligonychus ilicis (McGregor), dorsal view. Drawing by Division of Plant Industry. Figure 4. Illustration of male aedeagus of Oligonychus sp. Drawing by Division of Plant Industry. Many generations occur each year, but population densities are highest during the cooler months of spring and fall when prolonged periods of high humidity occur. 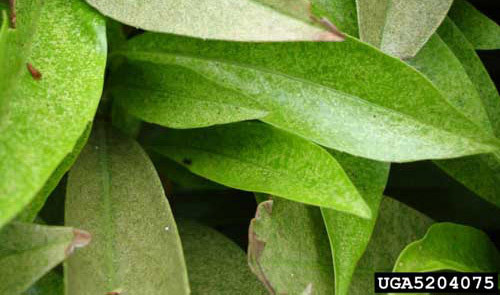 The species overwinters as red eggs on the undersides of leaves. However, darker summer eggs can be abundant on preferred hosts when infestations are not controlled. While some mites may be active during the summer months, most of the population is dormant (in aestivation) during the summer heat (Johnson and Lyon 1994). Common hosts are azaleas (Rhododendron spp.) and camellias (Camellia japonica). deer grass or meadow beauty, Rhexia sp. photinia or red tip, Photinia spp. This mite feeds primarily on foliage of woody ornamental plants. It is particularly a pest of azaleas and camellias. It usually attacks the lower leaf surface and as the population increases it will move to the upper surface of the leaves and on to small succulent stems. It injures the leaves causing a graying, stippling or mesophyll collapse, firing, and defoliation. The leaves may be distorted if infestation occurs when they are young and expanding (Johnson and Lyon 1994). Figure 5. Damage caused by a southern red mite, Oligonychus ilicis (McGregor), infestation on cherry laurel, Prunus laurocerasus L. Photograph by Frank A. Hale, University of Tennessee; www.forestryimages.org. Figure 6. Damage caused by a southern red mite, Oligonychus ilicis (McGregor), infestation. Photograph by J.L. Castner, University of Florida. Southern red mite populations reach peak levels during the winter months under mild, humid conditions. These mites can be found year round in the landscape, especially on elaeagnus and on shaded or stressed pyracantha. Populations in nurseries usually disappear when the new spring growth develops (Mizell et al. 2002). Use a 10× to 15× magnifying glass to examine the undersides of the leaves for the mites, cast skins and their webbing. A quicker method that many employ is to place a sheet of white paper or paper plate beneath the leaves and strike the foliage sharply. If mites are present they will fall onto the white surface where they can be more easily seen and identified than on the green foliage. Three different species of phtyoseiid mites were tested for predation of Oligonychus ilicis, with the adult females of the predators exhibing the most predation, preferring Oligonychus ilicis larvae over adults (Franco 2007). Anonymous. (2006). New Plant Pests and Diseases Recorded in Australia. Australian Government Department of Agriculture, Fisheries and Wildlife. Bolland HR, Gutierrez J, Flechtmann CHW. 1998. World catalogue of the spider mite family (Acari: Tetranychidae). Brill Academic Publishers, Leiden, 392 pp. Franco RA, Reis PR, Zacarias MS, Altoé BF. 2007. Predation potential of three species of phytoseiids on Oligonychus ilicis (McGregor, 1917) (Acari: Tetranychidae). Coffee Science 2: 175-187. Johnson WT, Lyon HH. 1994. Insects That Feed on Trees and Shrubs. An illustrated practical guide. 2nd ed. rev. Cornell University. Press, Ithaca, NY, USA. 560 pp. Knihinicki D, Keskula D, Herron G. (1999). The southern red mite: another new pest. The Nursery Papers. McGregor EA. 1917. Descriptions of seven new species of red spiders. Proceedings of the U.S. National Museum 51: 581-590. Mineiro JLC, Sato ME, Raga A, Arthur V, Moraes GJ. Sarreta FO, Carrijo A. 2006. 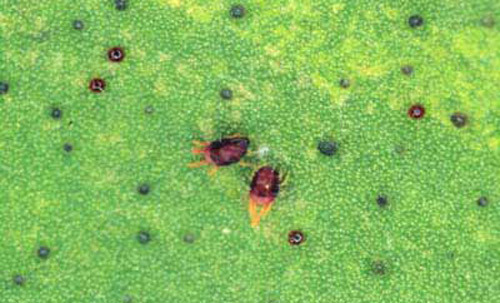 Diversity of mites (Arachnida: Acari) on Coffea arabica L. cv. Mundo Novo in Jeriquara and Garça counties, state of São Paulo. Biota Neotrop. 6: 2. Pritchard AE, Baker EW. 1955. A revision of the spider mite family Tetranychidae. Pacific Coast Entomological Society Memorandum 2: 472 pp. Reeves RM. 1963. Tetranychidae infesting woody plants in New York state, and a life history study of the elm spider mite, Eotetranychus matthyessei n. sp. Cornell University Agricultural Experiment Station, Memoir 380: 1-99. Originally published as DPI Entomology Circular 79. Updated for this publication.